Kumar Sangakkara and Mahela Jayawardene batted throughout the day to record unbeaten double hundreds and put Sri Lanka in total control of the first Test against South Africa today. England’s young batsmen Alastair Cook and Ian Bell scored second successive centuries to leave Pakistan facing near-inevitable defeat on the second day of the second Test today. 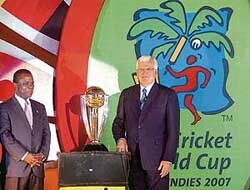 The 2007 cricket World Cup logo, mascot and tournament schedule were launched at a function here last night. Speaking on the occasion, Chris Dehring, managing director and CEO of ICC World Cup West Indies 2007 Inc, said the West Indians were the pioneers of one-day cricket as they had perfected this form of cricket “by playing Test cricket like one-day cricket”. Fresh from his gold medal-winning feat at the world championship, Abhinav Bindra today sought to bring the spotlight on shooting, saying that it should be regarded as the number one sport in the country as it brought the largest number of medals. Australia thrashed Argentina 6-0, Spain snatched a last-gasp 3-2 win over Pakistan and the Netherlands sweated to a 3-3 draw with Germany in the Champions Trophy hockey tournament here. After struggling with his game for weeks, Arjun Atwal seemed to have captured his old form at least for the day with a six-under 64 that saw him reach the second place after the first round of the US Bank Championship in Milwaukee’s Brown Deer Park Golf Course. Sania Mirza and her American partner Bethanie Mattek stormed into the semifinals with a facile 6-2, 6-2 victory over Shikha Uberoi and Jelena Jankovic of Serbia in the second round of the $ 600,000 Stanford Classic. India had to be content with the sixth place at the World Junior Squash Championship after they lost 0-2 to Germany at Palmerston North, New Zealand, today. He was once the captain of the national team, but a scholarship lured him to swap bat for book. However, Grenada Prime Minister Keith Mitchell remains loyal to his first love and his list of cricket greats includes Sachin Tendulkar. The Punjab Olympic Association (POA) will honour all sportspersons from the state who won medals at the Melbourne Commonwealth Games and the World Shooting Championship. At the close of the second day the pair, who came together with the total on 14 for two in reply to South Africa’s 169 yesterday, had taken the total to 485 for two. 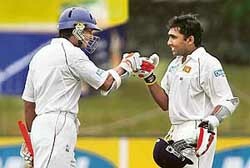 Captain Jaywardene was on 224 and Sangakkara had scored 229 in an unbroken third-wicket partnership of 471. The stand was the highest for any wicket against South Africa, surpassing the 385 scored by Steve Waugh and Greg Blewett at Johannesburg in 1997, as well the second highest partnership in the history of Test cricket. The only larger partnership is the 576 scored by team mates Sanath Jayasuriya and Roshan Mahanama against India at Premadasa International Stadium back in 1997, the match where Jayawardene made his debut. The hosts, who resumed on 128-2, have now stretched their lead to 316 runs and, with eight wickets still intact and three days still to play, have established a virtually impregnable position from which to force a victory. Sangakkara, dropped in the gully and bowled off a no ball before reaching double figures, was the more aggressive of the pair during the morning session and reached his 10th Test hundred just before lunch and his fourth double hundred during the final session. The 28-year-old left-hander, relieved of his wicket-keeping responsibilities for this match, had stroked 31 stylish boundaries from 307 balls at the Sinhalese Sports Club Ground. Jayawardene, Sri Lanka’s captain in the absence of the injured Marvan Atapattu, provided rock-solid support with a flawless and elegant 15th Test hundred that was then converted into his third double hundred with a six over mid-wicket. The 29-year-old right-hander finished the day struck 27 fours and one six from 356 deliveries. “We did know anything about the records and just tried to bat session by session to keep South Africa down,” Jayawardene said. The closest the tourists came to making a breakthrough was off the final over of the day when a thin edge off left-arm spinner Nicky Boje just evaded the gloves of wicketkeeper Mark Boucher. South Africa’s lacklustre bowlers, unable to find their best rhythm after a 10-week break, toiled throughout on a pitch that was slow and flat. Dale Steyn was statistically the most successful bowler after his new ball strike, finishing with figures of two for 98 from 19 overs. However, Boje was the most effective, clamping down on Sri Lanka’s run rate as he bowled over the wicket into the rough, occasionally extracting sharp turn and bounce from the bowler’s foot holes. The spinner, one of seven bowlers tried by a frustrated South African skipper, was the only bowler that looked likely to take a wicket and was unfortunate to finish with 0-131 from 35 overs of hard toil. Fall of wickets: 1-6, 2-14. The 21-year-old Cook made 127 while the 24-year-old Bell added 106 not out before the home side, resuming on 168 for two, declared on 461 for nine deep into the final session of another baking day at Old Trafford. Pakistan, needing 342 to make England bat again, survived the final four overs of the day to get to 12 without loss. England had resumed the day on 168 for two and lost Kevin Pietersen off the second legitimate delivery of the day. Having put on 74 with Cook for the third wicket, he failed to add to his overnight 38 before driving at a wide delivery from left-armer Gul and slicing to gully. Imran Farhat took a sharp catch, dislocating a finger in the process, but that was the only wicket to fall before lunch as England added 104 runs. Cook, 65 overnight, quietly accumulated while at the same time highlighting the Pakistani batsmen's lack of composure on Thursday. He reached his hundred with a nudge past slip off spinner Shahid Afridi, celebrating next ball with a fine square drive for four. It was his third test century in seven matches. Paul Collingwood added a bit of spice shortly before lunch. Dancing down to Danish Kaneria, he chipped the leg spinner for six over mid-on to take England's lead beyond 100. Moments later, to the biggest cheer of the afternoon, he produced a carbon-copy which also ended up in the Brian Statham stand. Pakistan, however, fought back in the afternoon as England slipped from 288 for three to 321 for six. Collingwood went first, a half-hearted pull at Gul ending in square leg’s hands and ending his 48-run stay as well as a 119-run stand for the fourth wicket. Cook was then adjudged lbw to a ball slanted across him and the out-of-form Geraint Jones managed one top-edged six over fine leg before being dismissed lbw by Mohammad Sami. Fall of wickets: 1-30, 2-95, 3-169, 4-288, 5-304, 6-321, 7-357, 8-384, 9-457. Bowling: Sami 28-5-92-2, Gul 28-2-96-3, Razzaq 19-4-72-2, Kaneria 37-8-106-1, Afridi 21-0-76-1. He said the World Cup, to be jointly sponsored by LG, Pepsi, Hutch and Hero Honda, who had pooled in $ 150 million, would be a great opportunity to experience the true spirit of the Caribbean. Allaying the fears that the West Indies would not be able to cope up with the rush, particularly in the case of accommodation, the smooth-talking Chris Dehring said all sorts of accommodation would be sourced, including stationary cruise ships, for sheltering the large number of visitors expected for the World Cup, which will also be a window of opportunity for those seeking to establish business partnerships with the Caribbean countries. International Cricket Council Chief Executive Officer Malcolm Speed and Prime Minister of Grenada Keith Mitchell were also present at the function. Speed said in less than seven and half months, the world would witness one of the great cricketing events as the West Indies would prove to be the ultimate hosts. He said only one visa would be required for those wanting to visit the Caribbean for the World Cup. The visas will be issued by the New Delhi-based High Commissions of Great Britain, Trinidad and Tobago and Guyana. The tickets have been priced from $ 20 to 100. “In my opinion, shooting is the number one sport in the country. We have had Olympic medallists, world champions and world record holders in the sport. No other game can match the success achieved by Indian shooters,” Bindra told reporters on his arrival from Munich today. The Chandigarh marksman won India’s first-ever gold medal at the ongoing World Championship in Zagreb, Croatia, in the 10m air rifle category. He also claimed a quota place for the Beijing Olympics by capturing the top spot at the elite event. Claiming that the country had a very good bunch of shooters at the moment, Bindra said more laurels could be expected in coming major championships. “We have a very talented group of shooters at present. The sport is one in which India is very strong. We always have the confidence that we can win,” he said. Bindra won the gold in Zagreb despite a persistent back injury that had dogged him for a long time. But he did not let it affect his performance adversely. “I pushed the injury to the back of my mind and concentrated on the competition. It did not affect me during shooting,” he said. However, Bindra went straight to Germany after his golden feat to seek medical advice. “My main priority now is to recover and get my body into shape and I will be on rehabilitation for three months,” he said. Bindra shot 699.7 (597+102.7) in Croatia to win the gold to qualify for his third Olympics at Beijing. The qualification score was identical to the one he achieved at the Athens Olympics in 2004 where he could manage only the seventh place. But the 23-year-old was undeterred. “Shooting is a very individual and competitive sport and performances and results may vary from day to day. You need things to go your way. They did so for me in Croatia unlike at Athens,” he said. Describing compatriot Manavjit Singh Sandhu’s gold medal-winning effort in the individual trap event at Zagreb yesterday as “great”, Bindra said with such shooters — he included Gagan Narang as well — India had a great chance of a rich medal haul at Beijing. The defending champions bounced back from their 3-5 humbling at the hands of their Spanish hosts earlier this week as the Latin Americans’ usual energy and drive appeared to desert them. Luke Doerner made no mistake with three penalty-corner conversions, while field goals from Grant Schubert, Michael Boyce and Michal McCann put the result well beyond reach. In an earlier match, Spain led 2-1 thanks to a field goal and a penalty conversion by Santiago Freixa with just two minutes left. But then Sohail Abbas drew level with a penalty-corner conversion after Akhtar Ali had opened Pakistan’s scoring with a deflection at the right post on a cross by Muhammad Saqlain. However, Muhammad Imran limped off the field and, with 10 seconds left for the final whistle, Spanish captain Francisco Fabregas took a free hit outside the circle to Sergi Enrique, whose shot went high into the goal. Pakistani coach Asif Bajwa said his side were feeling the strain after a 2-9 mauling by the Netherlands on Tuesday. The Netherlands played catch-up with Germany in oppressive heat and humidity to draw 3-3 in the first match yesterday. Germany’s Matthias Witthaus kept his side in the game through goals five minutes into the match and just before the break by punishing Dutch defensive errors to score with unchallenged shots in the circle. But Matthias Brouwer and Nick Meijer set up tap-in goals from the left for Rob Reckers and Karel Klaver to even the score 2-2 at half time. Germany surged ahead 3-2 soon after the restart off Christopher Zeller’s penalty-corner conversion until Taeke Taekema levelled the score again with his conversion of a second Dutch penalty corner. Germany’s deep defence was in trouble in the final phases, their woes compounded by Zeller’s yellow card suspension just seven minutes from the hooter. The Indian was three shots behind leader Corey Pavin, who at one stage with eight-under 26 for the front nine looked set for a sub-60 score. Atwal birdied the second and then added three more in a row from sixth to eighth to turn in four-under. Two more birdies on the 13th and 14th came before he dropped a shot on the 15th. But he made up on the 18th with a birdie that saw him finish at six-under. Omaezaki (Japan): Jeev Milkha Singh returned an impressive three-under 68 card to rise to the tied 10th spot after the second round of the 120 million yen Omaezaki Golf Tournament here on Friday. The seasoned pro dropped a bogey on each nine against five birdies to accumulate a two-day total of four-under 138 and remain in contention for another top-five finish at the Japan Golf Tour event. 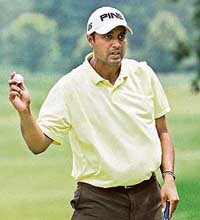 Gut Kaden (Germany): Jyoti Randhawa had a superb back nine at the Gut Kaden Golf and Land Club, but cooled off on his second nine for card a four-under 68 to be tied 21st after the first round of the Deutsche Bank Players’ Championship of Europe. India’s other challenger, Shiv Kapur brought in a level par round of 72 and was tied 103rd, needing a good second round to make the weekend. The Indo-US pair will now take on the winners of the other second-round match between the Italian-Argentine duo of Maria Elena Camerin and Gisela Dulko and Ukrainian sisters Alona and Kateryna Bondarenko. Sania, who crashed out of the singles event in the first round, continued with her good doubles form which has seen her rise to a career-high 31 in WTA rankings, and teaming up with Bethanie she hardly put a foot wrong in the match. The Indian teen and her American partner were at their aggressive best as they outplayed Sania’s Fed Cup partner Shikha and her comrade-in-arms Jelena. In the opening match, Simon Rosner gave a squash lesson to Sandeep Jangra. He was too quick for the Indian, winning comfortably. Sandeep lost 2-9, 0-9, 0-9. Naresh Kumar was in total control of the match against Florian Silbernagl, winning the first two games before his left-handed opponent raised his game. In an interview with UNI here last night, Dr Mitchell — also Chairman of the CARICOM Prime Minister’s Sub-Committee on Cricket — said he was an ardent Tendulkar fan with a dislike for the Tendulkar-Brian Lara comparison. 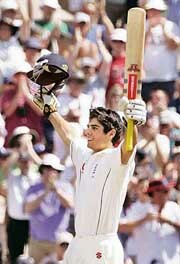 “Tendulkar, without an iota of a doubt, ranks among the all-time greats. I just like him. He is such an exciting player. A great player’s hallmark is whatever be the situation, he comes and starts dictating terms and that’s what Tendulkar has done so often,” he said. He, however, steers clear of the Lara vs Tendulkar debate and insists that it is not right to compare the two batting maestros. Dr Mitchell also has high respect for Sunil Gavaskar. “Of course we remember him. How can you forget his 1970-71 debut? I tell you, he was the most difficult batsman to bowl to,” he said of the legendary opener. A team-mate of Charlie Griffith, best remembered for cracking Nari Contractor’s skull on the 1960-61 tour, Dr Mitchell was a member of the Grenada national team from 1964-66 and became captain in 1973, leading Combined Windward and Leeward Youth team in between. “I was an off-spinner who could bat at number six. Griffith was my team-mate and Everton Weeks, one of the three Ws, was the team manager. But then I got a scholarship and I had to make a choice. I thought cricket won’t serve me after I stop playing but a degree would help me in my career. “Coming from a poor family, I could not have afforded the cost of studies. So I left cricket and did my bachelor’s degree in mathematics and chemistry before doing my master’s and doctorate in mathematics and statistics from Howard University,” he reminisced. He, in fact, remembers playing a match with Kapil’s Devils after the Indian team had won the 1983 World Cup. “The match was played in Washington and I remember Kapil, Ravi Shastri and that bald wicketkeeper (Syed Kirmani),” he recalled. And his love for the game took him to St Kitt’s where Rahul Dravid’s Team India took on Lara’s boys. Irked with the state of affairs in West Indies cricket, Dr Mitchell has his hopes pinned on captain Lara, who, according to him, has turned the team into a fighting unit. Dr Mitchell described the contract dispute between the West Indies Cricket Board and the Players’ Association an ugly controversy and said the row needed to be settled at the earliest to prevent any long-term damage to Caribbean cricket. Talking to The Tribune here today, the president of the POA, Mr Sukhdev Singh Dhindsa, said a committee headed by Mr Rajdeep Singh Gill, President, Basketball Federation of India, had been constituted to decide norms for granting financial benefits to the Commonwealth Games medal winners as well as medal winners at the World Shooting Championship. Mr Dhindsa said other member of the committee would be Raja Sidhu. Congratulating Abhinav Bindra, Manavjit Sandhu, Avneet Kaur Sidhu and other shooters from Punjab for their excellent performance in the World Shooting Championship, he hoped that these shooters would also bring laurels to the country in the 2008 Olympic Games in Beijing.